The ironically – or Orwellian – name Affordable Care Act (ACA) aka Obama is and was from its inception a failure- a fail of care and a failure on the part of Democrats to care about the consequences of their actions. Hellfire and their damnation! It was a failure on their part to even read the omnibus bill before forcing it into law and upon the American people. 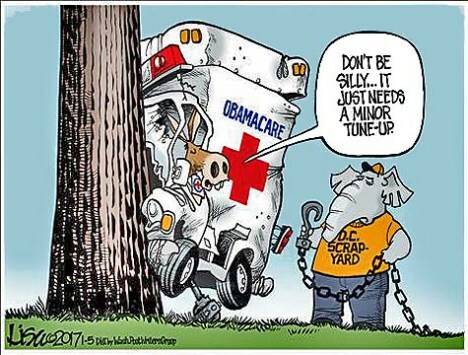 This failure resulted in a new “healthcare system” that was broken, that needed more than minor fixes to work even so well as what America had before – despite all of Obama’s tap-dancing and the Congressional Democrats’ dissembling. ObamaCare needed to be sent to the proverbial scrapyard and, in theory, replaced with something that could actually work in America. Over the course of the intervening seven painful years, it seemed that Congressional Republicans understood this. Sadly for we, the People, seeming isn’t being. 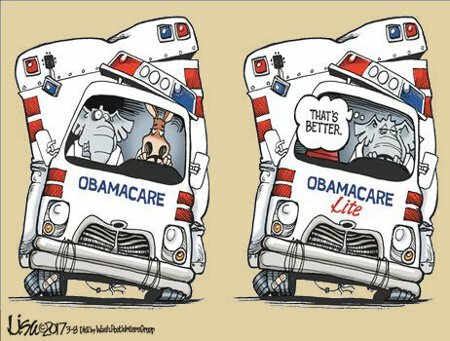 What the GOP seems to think are fixes for ObamaCare are, in my opinion, merely a hodgepodge of removals of various components and restrictions within the ACA with – once again – a failure to care about the consequences of their actions. No, instead of the promised “Repeal and Replace,” the American Health Care Act (AHCA) aka RyanCare is little more than a shade tree patch job of ObamaCare and a bad one at that. This entry was posted on Tuesday, March 21st, 2017 at 7:01 am and is filed under Politics. You can leave a response, or trackback from your own site.